24/2/09 – Acquisition – Paris, Musée d’Orsay – The Yves Saint-Laurent and Pierre Bergé auction has given rise to last minute negotiations. It is well known that for important sales it is common for the French government to reach an agreement with the seller : a certain object is donated in exchange for an export permit for the rest. The Louvre had already received a Goya (see news item of 1/10/08) donated by Pierre Bergé. 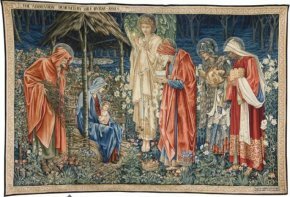 Today, Orsay will inherit a very beautiful tapestry which is remarkably well preserved, executed according to drawings by Edward Burne-Jones and woven at the company founded by Willliam Morris. Orsay already holds two paintings by Burne-Jones, The Wheel of Fortune and Princess Sabra, as well as several decorative hangings by William Morris. The Saint-Laurent and Bergé auction includes two other works by Burne-Jones : Paradise with the Adoration of the Lamb, a group of five panels which are preparatory drawings for a stained-glass window, and an oil on canvas, Luna. Regarding the composition, please see the catalogue for the Orsay exhibition in 1999, Edward Burne-Jones, Un maitre anglais de l’imaginaire, pp. 293-295.